18k white gold heart pendant,0.2340 ct of diamonds. Fall in love with fashion. Whether you give this heart to a loved one or get it for yourself, it will say it all without saying a word. 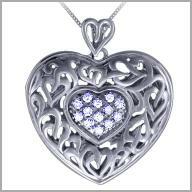 18K white gold , its satin finish and detailed edges and heart diamond center are sure to capture attention. It measures 1-1/8"L x 1-1/16"W and includes a 18' chain. Diamond weight is 0.2340ct G-H in color and SI in clarity.